As a family dentistry, we are committed to providing exceptional dental care as your child grows and their needs change. Proper dental care for your child begins almost immediately, but you don't need to schedule an office visit until your child is 1 to 2 years old. When they're ready, we provide gentle, friendly care from the first visit on, and we can perform all the necessary procedures that your child may need including exams, cleanings, fillings, x-rays, fluoride treatments and extractions. We provide dental sealant treatments designed to prevent tooth decay in premolars and molars (teeth in the back of the mouth). A sealant is a thin resin coating that is placed on top of the teeth and quickly conforms to the grooves of the tooth to create a barrier, reducing one's risk to decay. Dental sealants can last for many years, and we're able to inspect them regularly and evaluate if additional treatments are needed during your checkups. As you grow older, your teeth may become yellowed or darkened, and whitening treatments are a great way to reverse staining or discoloration. Over time, certain food and drinks, tobacco use, specific medications and even trauma can have an effect on the color of your teeth. While over-the-counter whitening treatments and toothpastes can be successful in treating discoloration, professional whitening treatments are often the most effective whitening option available. Contact us about the best option for you. When an unexpected dental emergency strikes, count on Grace & Leedy for the urgent care you need. We can help with toothaches, broken or chipped teeth, loose or knocked out teeth and certain jaw injuries. Make sure to contact us immediately as soon as the trauma or pain begins. For injuries to the teeth, make sure to rinse your mouth with warm water before you leave for the office. Wrap chips and tooth fragments in a moist washcloth. If your tooth is knocked out, rinse your mouth, but don't touch any of the root portion. Place the knocked-out tooth gently back in your mouth (in the area between the gums and lips) or in a glass of milk and call us immediately. For jaw injuries, place ice on the swollen area before you call our office. In the event of a serious emergency, please dial 911. Good dental health begins with proper brushing and flossing habits, but you need to visit your dentist every 6 months or so for in-office cleaning and preventative care. Typical cleaning procedures include the removal of tartar and plaque, polishing teeth, cleaning dentures and other implants, applying sealants, and administering fluoride treatments. In addition, we can evaluate signs of potential oral cancer, check the condition of your gums and perform X-rays to check the integrity of your teeth. Halitosis is the medical term given for bad breath, and it can result from a variety of conditions including poor dental health, the onset of gum disease or even chronic dehydration. The growth of certain bacteria on the back of the tongue can also cause halitosis. If you're concerned you may be suffering from chronic bad breath, we can help you diagnose potential causes and evaluate the best treatment options for you. Xerostomia, or an excessively dry mouth, can be caused by a variety of factors. Left untreated, it can lead to tooth decay. Often consciously drinking more fluids is the easiest method of treatment, but if you find this isn't helping, we are able to diagnose other factors that may be causing your dry mouth and recommend appropriate treatment options. Tooth sensitivity is a common condition where the inner layer of the tooth becomes exposed. It is often accompanied by pain, and hot or cold conditions can increase the pain in sensitive teeth. There are several causes of tooth sensitivity, and they range from brushing too hard to using too much whitening toothpaste. Sensitivity can even signal more severe dental problems like damaged teeth, receding gums or gum disease. We'll help you determine the causes of your sensitivity and suggest proper treatments to prevent it in the future. If you're active or routinely engage in sports where contact is likely, then you need to consider a custom mouthguard to protect your teeth while you play. Mouthguards shield your teeth from any substantial impacts sustained while you're active, and they're especially important for adolescents or anyone who has dental implants. We will take measurements of your mouth and craft an athletic mouthguard tailored for your individual needs. The result is a mouthguard that will protect you far better than a one-size-fits-all model off the shelf. Periodontal or gum disease is a serious condition that can effect the overall health of your mouth. Left untreated, periodontal disease can cause you to lose your teeth. Periodontitis is an advanced condition of gingivitis where the gums become red, swollen and bleed easily. As gingivitis progresses into periodontal disease, the gums pull away from the teeth and bacteria attacks the roots and bones of the teeth. Treatments for periodontal disease include controlling the infection with mouthwashes or medication and deep cleaning both above and below the gum line. We can help diagnose and treat gum disease in-office to achieve the best possible outcome. Are you experiencing unexplained headaches or jaw and neck pain? You may be one of the million Americans who suffer from TMJ / TMD or Temporal Mandibular Dysfunction. TMJ / TMD can create several painful symptoms that may be hard to diagnose, but we can help determine whether TMJ is impacting you and the best course of action for treatment. Often TMJ can be treated at home, but if we determine in-office treatment is the best option, we'll walk you through appliance therapy, surgery or other options to determine what is best for you. We're all familiar with the annoyance and discomfort that comes with snoring, but it can signal a sleep disorder that left untreated could lead to serious complications. Sleep Apnea is a condition where patients stop breathing as they sleep, and it is almost always signaled by loud, frequent snoring. People who experience sleep Apnea are at greater risk for high blood pressure, stroke, and heart failure. If you're concerned your snoring may be more than just an annoyance, we encourage you to schedule a consultation so we can evaluate whether you have sleep Apnea or just snoring problems. Sleep Apnea can be treated with important lifestyle changes like losing weight and reducing alcohol consumption, but if we deem you need further treatment, we'll walk you through CPAP, dental device and surgery options. Dental fillings are a treatment used to repair tooth decay, cavities and other minor tooth damage. Fillings can be made from a wide variety of materials, and the typical filling procedure can be completed in one office visit. The cavity or damaged area is cleaned, the filling material is inserted and a bonding process is administered to cement the filling in place. Depending on the material, fillings can last up to 10 or 12 years. We will help you determine the best filling options for you as well as inspect fillings to make sure they are functioning correctly in future checkups. Dental crowns are cap-like structures that encase damaged teeth and protect them from future decay. Crowns can encase an entire tooth or just a portion of it depending on the condition of the tooth and the severity of the damage. Often, a temporary crown is created while a mold of the tooth is sent off to create a more exact, permanent crown. Once the permanent crown is ready, the temporary crown is removed and the new crown is cemented into place. We are able to evaluate any potential need for crowns as well as alternative treatment options in our office. A veneer is a shell placed on the front of the tooth made from porcelain or other materials. Veneers are primarily used for cosmetic reasons, that is to fix gaps in teeth that can't be corrected by orthodontics or to cover up severely discolored teeth. Often veneers should not be placed on top of healthy teeth, and we can help you determine whether veneers or less-invasive treatments like whitening are the better option for you. Dental bonding is a cosmetic procedure where material is attached or bonded to the teeth to cover up decay or repair chips or cracks. Cosmetic bonding can also be used to correct gaps in teeth, protect exposed tooth roots, and as a cosmetic substitute for fillings. The bonding material is a special resin that is colored like teeth, and after it is inserted, we use an intense light to seal and harden the resin. Bonding is best suited for small cosmetic changes, and we can help you determine where dental bonding might help improve your smile. Dental Implants – Dental implants are replacement tooth roots that provide a solid base for artificial teeth. Implants are placed directly into the area where the tooth root was previously located. They help maintain proper jaw shape and allow the patient to eat and chew all the foods they normally enjoy. We will evaluate whether a dental implant is the right procedure for you and walk you through and perform all the necessary steps for treatment. Bridges – A dental bridge is an alternative form of missing tooth replacement that relies on adjacent healthy teeth to form a “bridge” over the missing tooth. Often crowns are placed on either side of the missing tooth as anchors, and an artificial tooth is held in place by these anchors. Bridges are a permanent form of missing tooth replacement, and it is often performed on front teeth. We can help determine whether a dental bridge is right for you and perform all the necessary procedures in-office. Dentures – Dentures are the third variety of missing teeth replacement that involve a removable device. Dentures can either replace all of the teeth or just a portion of the teeth in the patient's mouth. Dentures are a good option for those who have experienced significant tooth decay through diseases like Periodontal (gum) disease or those who have sustained substantial trauma to the mouth. In some cases, additional surgery or extractions may be necessary to ready the patient for dentures. We are here to help you identify when dentures are a prudent treatment option. Extractions are the removal of a tooth for various different reasons. Informally most know this procedure as “having a tooth pulled.” Teeth are removed from the socket in the jaw, and most extractions can be performed in office, although in some cases surgery is required. Reasons for extraction include wisdom teeth removal, severe trauma or damage, and orthodontic treatment. In some cases teeth may need to be removed because of chemotherapy treatments or organ transplants. 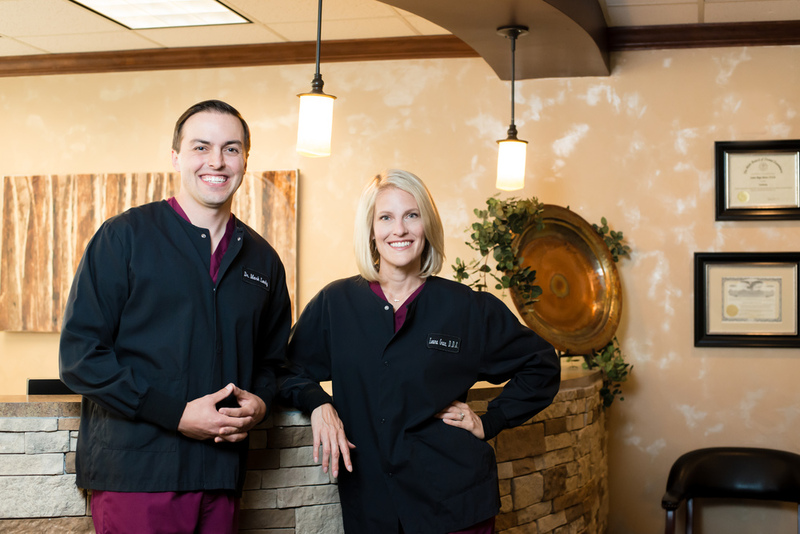 Here at Grace & Leedy, we will make every effort to save your teeth before resorting to an extraction, but if we determine it is the prudent course of action, we can perform most procedures in the office. A root canal is a procedure used when the root of the tooth has become infected. Often a root canal is used to save a tooth that would otherwise need to be extracted. The clearest sign that a root canal is needed is a persistent toothache. It may even feel like several teeth around the infected tooth are aching. Root canal treatment involves cleaning out all the nerves within the root of the tooth and then sealing those areas with root filling. We can evaluate whether a root canal is the appropriate and recommended treatment for you.